A few weeks ago I was going through Lotte's fall clothes that she wore last year and some of the clothes my niece had outgrown that were passed down to her, and many of them are too small. My girl seems to have managed to somehow completely skip size 3 and go straight into size 4. I can't believe how fast she's growing. She doesn't look as big as a size 4, which is puzzling, but it is what it is. I'm in a little bit of denial that she's almost three. She's still my baby! One of the many things that she has outgrown are her sweaters, and her sweet little sweater dress...Which made her look a combination of saucy and cozy, the two top toddler things that make me melt. So of course, another sweater dress is in order. I decided to go with this super simple pattern, but i'm just going to lengthen the body. I'm undecided on shaping the dress/skirt portion, i'll mostly likely decide as I go. Toddlers can get away with a straight up and down tube for a dress, it's the one age where it's fun to show off their chubby little bellies. Also, the for the sleeves, I'll probably make them either short (so she can wear a long sleeve t-shirt underneath if it's cool) or possibly 3/4 length, depending on how much yarn I have left. I'm using hand dyed, so I can't buy more if I run out. Lotte thinks I need to make a matching one for our October due wee one, and I just might. I'd like to make that one a bunting though. Sweater dresses aren't so practical on newborns, are they? And speaking of denial, I should really probably get cracking on these baby knits I have plans for. I have about eight weeks left is all. Somehow, despite being rather large and quite miserable, I've unintentionally been putting this pregnancy at the back of my mind. No, not the baby, but the pregnancy. People keep asking me how many weeks I am, and if it weren't for midwife appointments, I'd have no clue. I know when I'm due, that's about it. Maybe it's a fourth baby thing. I don't feel like this is such a mystery anymore, and don't have a gazillion questions to research or ask my midwife. My midwife told me that our appointments feel almost silly since I have nothing to ask her. Been there, done that? So we end up talking about Knitting, naturally. 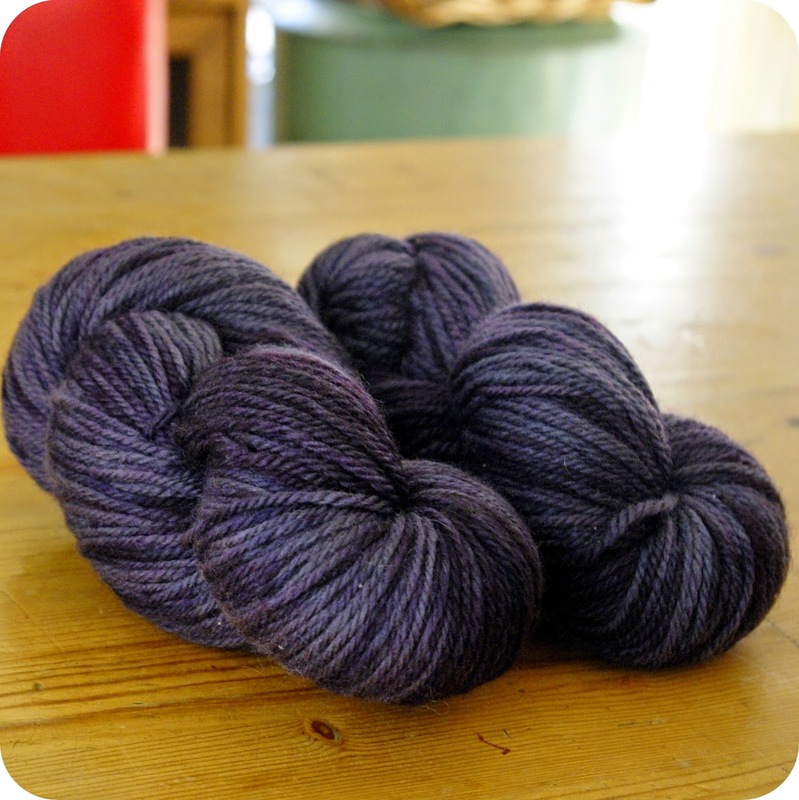 Love the rich tones of this yarn- this will so gorgy. Love that yarn! I have a 4 yr old and 3 yr old... my 4 yr old is so petite and stays in the same size clothes for so long. My three year old doesn't look that big but is built differently and also skipped 3T almost and she won't be 4 til next spring. Makes me sad because I fear most of the cute fall 3Ts won't fit... Guess I better get knitting! One of my favorite colors! Knitting dresses & tunics for my 3yo has been some of my favorite knitting...I will be so sad if there isn't another little wee one in our future to knit for, but it is what it is either way...congrats on the autumn baby! My favorite season. LOVE your yarn choice. At least Lotte growing so fast is a good excuse to make her some more things :) I've added that pattern to my Ravelry favourites, it looks very versatile. blessings on your baby and children! beautiful blue yarn, that should look really lovely! Our babies grow way too fast if you ask me :) The yarn you picked for the toddler dress is beautiful. Wow, you don't have long left until you have a new itty bitty one, how wonderful! Sweater dresses are totally practical for newborns, nice and warm, easy for changing...my boys both wore nighties and tights for the first month!